Time Warp is one of Discovery’s newest shows and it’s definitely worth watching… even if you’re not a science geek. Hosts Jeff Lieberman and Matt Kearney are on the prowl for anything and everything that might be cool to examine under high-speed photography. 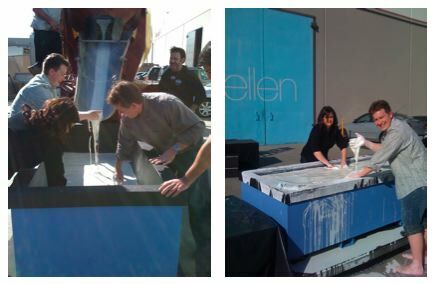 On the November 5, 2008 episode, Time Warp featured the Cornstarch Walk on Water stunt our team created for the Ellen Show back in February. It’s good to see that our mixing proportions of 2,500 pounds of cornstarch to about 200 gallons of water – all mixed in a cement truck – worked well for them, too. The best part of the segment was the slow motion photography showing just how the non-Newtonian cornstarch and water mixtures behaves under stress. The images are nothing short of amazing. Here are our behind the scenes images of how to prepare the mixture – cement truck and all – at the Ellen Show and an inside look at just how messy the process really is. But it’s worth it! Want to try it on a smaller scale? Learn how to make a backyard version of the Cornstarch Walk on Water. me and my partner are having a upcoming science fair and it is mandatory for our grade! please we have a 61 by 40.6 box how many boxes of cornstarch do we need and how much water please i beg you reply me! we seriosly need help. Here are the mixing proportions for the Cornstarch Water Walk… hope that helps!